Dennis is a lawyer that fights Medicare/Medicaid fraud. So he's pretty much the love child of Daredevil and Batman. Dennis started improvising in high school with his theater class. After a long hiatus, Dennis took classes and performed at Second City while in law school. 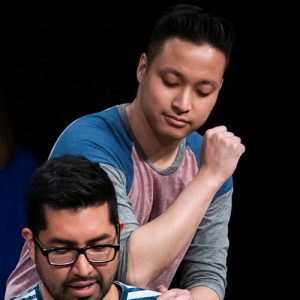 After moving to DC, he dove into long-form improv at WIT and graduated in March of 2018. He is part of the indie group, Follow the Lisa. Dennis was an amateur theologian in Southern California before going to law school in Chicago. He has since found that life as a lawyer is nothing like how it is portrayed in “Suits,” Sadly, he has yet to yell “I WANT THE TRUTH!” in a courtroom (one day though). If you want to be his friend, bring him a New York cheesecake and/ or a nice glass of whiskey neat.